—From style options to functionality considerations, is this popular feature right for you? Interest in beach entry swimming pools continues to grow among pool buyers, so let’s look at the great reasons why—and examine if this design upgrade makes sense for your new concrete (gunite/shotcrete) pool. What exactly does this decorative and functional option—also called a zero entry or walk-in pool—entail? How is it configured? What are its advantages? Are there any potential drawbacks? How much will it cost? See some beach entry photos that illustrate some of the possible design variations. Knowing these answers will help you determine—in conjunction with your pool builder—whether or not including this upgrade on a new pool is the best choice for you and your family. What is a beach entry pool design (also known as zero-entry pool)? Positioned at the pool’s shallow end, the entry point is constructed to be even with the deck. Most of the entry is submerged, but a small section of it—the top part where it meets the deck—is usually dry. Sloping from the deck—like a long ramp—into the pool, the entry becomes progressively deeper with each step. 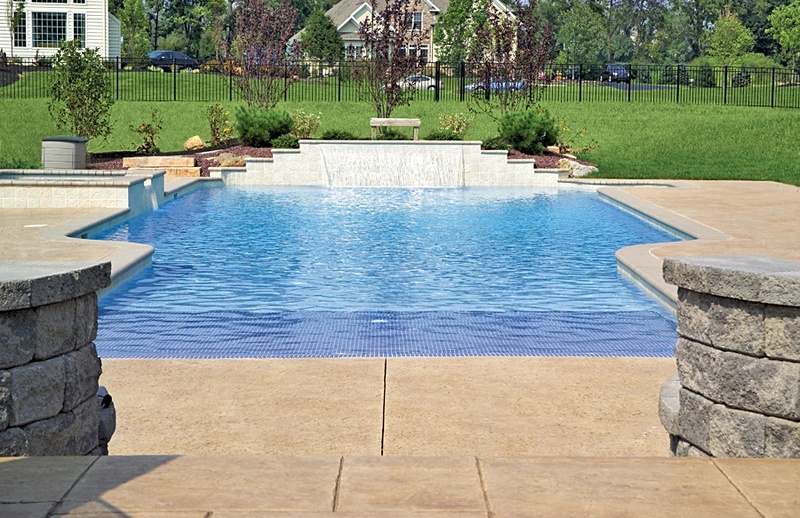 As you walk into the pool, this configuration provides a gentle transition into deeper water. Beach entries are a custom feature. Your builder will tailor its configuration to complement your pool. Many are built the same width as the pool—typically 10 to 20 feet. However, they can be narrow as well, spanning only several feet. 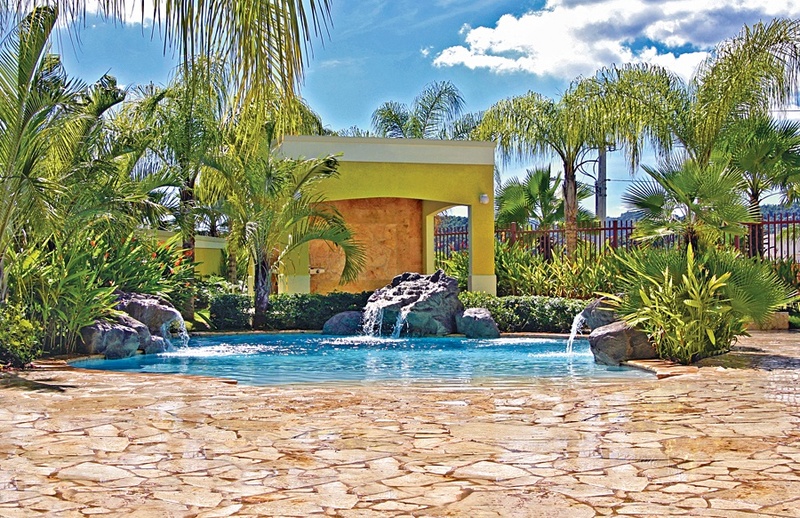 This lagoon pool captures the natural style that’s ideally suited for a beach entry. A number of factors go into the design and construction of a beach entry. Some relate to style and aesthetics, while others come down to practical issues such as building code compliance. Here are the main ones that you and your contractor will need to consider. In many cases, a beach entry includes some form of accent or feature (described below) on its sides. Along with the decorative touch they bring, these elements distinguish the area: They provide a visual cue to let pool users know that the bottom is sloped and increasing in depth. A popular approach for demarcating the entry is using partially submerged accent boulders or small ornamental statues, such as those of creatures like frogs and turtles. Boulders flank this beach entry, helping to visually delineate it from the pool deck. They also serve as the transition point between the vertical wall of the pool and the start of the beach entry. Another attractive method for achieving a similar effect is with one or more bubbler fountains. With selected beach-entry designs, some pool builders plumb several of these water features into the structure. When you turn on the fountains, they spout flowing water that rises from the entry floor—thereby demarcating the entry area and its unique depth. A newer trend for accessorizing an entry is to add a patio umbrella. Builders can construct the entry with an integrated sleeve for inserting a pole. The umbrella canopy colorfully announces the pool entryway. It also conveniently creates a shady spot in a few inches of water. Your contractor may use an option that not only marks the entry but adds functionality. Particularly for a pool that will be regularly used by someone with mobility challenges, a practical choice is integrating a handrail into the feature. This accessory will provide extra support for maintaining stability when entering the water. In developing the entry design, you will want to consider its exterior appearance. The material that covers its surface will heavily impact the entry’s visual appeal. First, it’s important to understand that external conditions limit material choices for the entry—or will force a design modification. Here’s why: Typically, the beach entry is both wet and dry; a majority of the structure is in the water, but a portion of it transitions to the pool deck. As a result, the area where the two structures meet will be outside of the water and dry. Most beach entries involve this wet-and-dry configuration. Now, since all three kinds of pool interior surface materials—marcite plaster, color quartz, and pebble finish—are developed specifically for underwater use, they will deteriorate if outside and dry. So, they cannot be used for covering many beach entries—or at least the portion—that will be exposed to air. Two design approaches can address this wet-dry challenge. One is a material choice, and the other is a modified configuration. A simple, attractive option is to choose an appropriate material for the entry’s exterior. 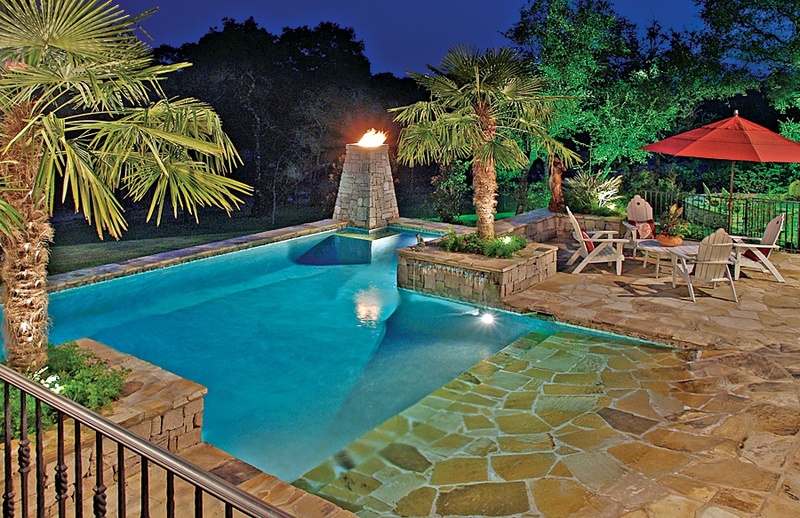 Overwhelmingly, pool builders rely on natural flagstone for this job. Most any variety of flagstone will do the job. 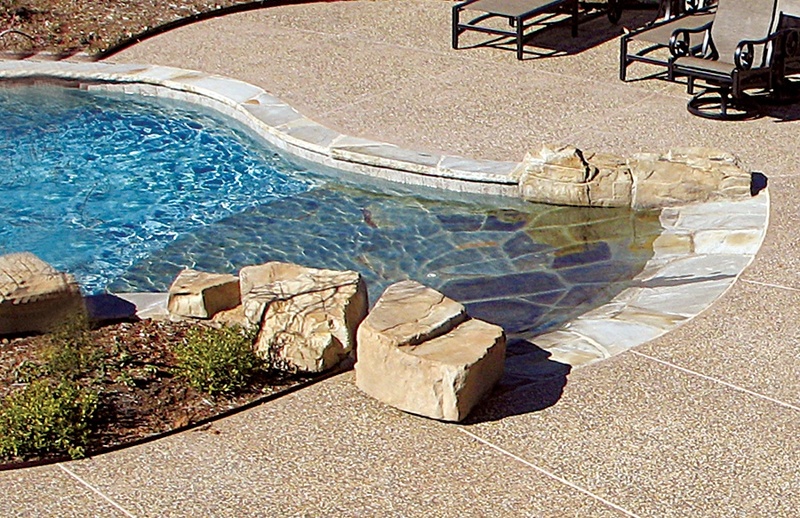 Along with its good looks, flagstone performs well on both dry land or in water. If your project plan incorporates flagstone for the patio deck or perimeter coping that outlines the pool, you have an added design opportunity: Simply use the same flagstone on the beach entry; doing so will produce a cohesive, coordinated aesthetic for your poolscape. Another way to integrate flagstone on a wet-dry entry involves a hybrid approach. Cover most of the entry—the portion that will always be underwater—with the same surface material as the rest of the pool interior: marcite, quartz or pebble. Then, apply flagstone only on the upper, shallow section of the entry that meets the deck with a dry transition point. While flagstone is by far most the common option for decorating a wet-dry beach entry, it is not the only one. A rare, highly customized option is non-skid ceramic tile. Installation requires a high level of technical skill to achieve a smooth transition to the deck—as well as a high price tag to match. In some cases, pool builders tweak the beach entry design so all of it remains inside the water. This approach allows the surface material to be identical to the finish on the rest of the pool—marcite, quartz, or pebble. The result is an entry appearance that blends more seamlessly into the rest of the pool. To achieve a 100-percent wet entry, your pool design must make a minor sacrifice to the ideal beach entry configuration. Instead of a perfectly smooth entry-to-deck transition, the design will allow a subtle separation or barrier between the entry and the deck. For example, it can incorporate a tiny step—as small as an inch or two deep—from the deck into the water-covered entry. Or it may call for a kind of “softly rolled edge” that contains the pool water entry and separates it from the deck. One common approach is to use a material with a color that contrasts with the rest of the pool’s interior. Doing so makes the beach entry a strong focal point in the overall poolscape. It’s worth noting that unto itself, a distinguishing surface color can serve as the visual marker for the entry. For example, an orange-hued flagstone will “pop” when you view it next to a soft-blue quartz finish that covers the rest of the pool interior. With colored stone or tile that stands out from the rest of the pool interior, including visual accent markers like those described above—boulders, statues, fountains, and umbrellas—becomes less important. Beach entry benefits: Is this feature right for your family? 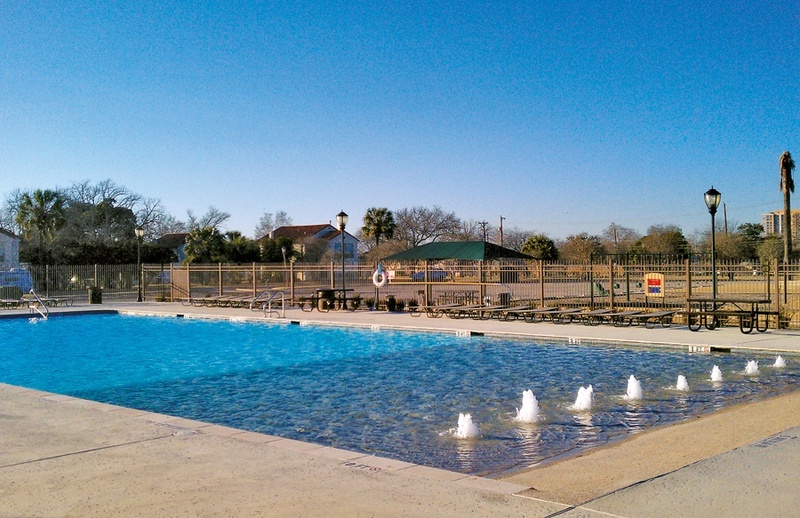 • One reason for growing interest in beach entries is because they make it easier for some individuals to enjoy a pool’s recreational—even therapeutic—benefits. That makes this feature a great choice for families with members who have physical disabilities or mobility issues—whether the impairment is permanent or temporary. Substituting traditional pool stairs with a beach entry makes accessing the water possible for those with difficulty raising their legs, bending their knees, or stepping while simultaneously grasping a handrail. Someone using a pool-access wheelchair can even role into the water and remain in the depth that suits them. • For small children, the tapered entry may be easier to negotiate than regular pool steps. Kids love the shallow “splash & play area” that a beach entry provides. Your pet pooch might enjoy the shallow area as well. • Along with facilitating physical access, a beach entry may decrease any psychological barriers to getting into a pool. Some may find the gradual slope into deeper water less intimidating. The ability to more slowly and incrementally enter an aquatic environment will often be more appealing to a child, someone learning to swim, or anyone trying to slowly tackle their fear of the water. • Depending on the entry’s slope and configuration, it can function like a tanning ledge for sunbathers; you can lie on the surface submerged in few inches to help keep cool while taking in the sun’s rays. • Cautious or temperature-sensitive swimmers can enjoy a bit of added comfort since they can descend into the water much more gradually than they could with regular pool steps. • The design perfectly supports a lagoon-style pool concept—such as a free-form shape with a flagstone deck and tropical landscaping. This highly creative approach to a beach entry pool boldly incorporates an elevated spa. Will a beach entry pool match your backyard needs and project goals? When debating a beach entry for your private aquatic resort, you have several practical design and project considerations. 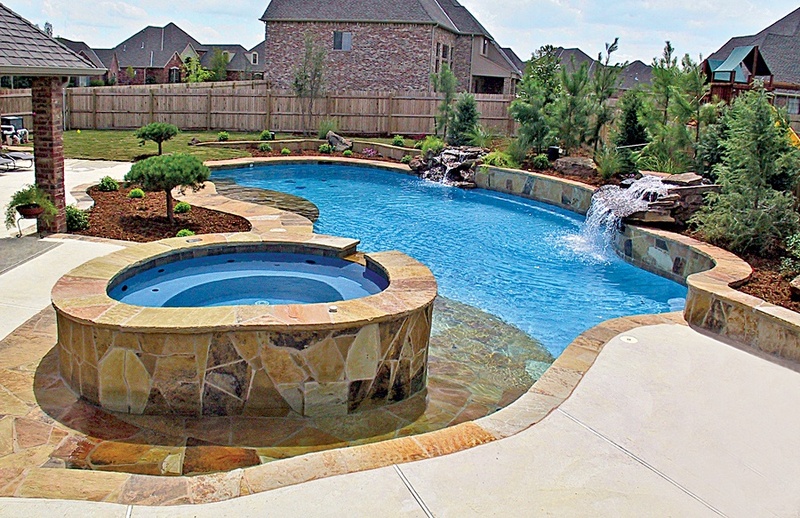 Here are several critical points to discuss with your pool builder. The first matter is the size of your pool. That’s because this special kind of entry will gobble up a significant amount of length to reach the pool bottom. Certain factors—such as the pool shape and entry width—can influence the final amount of length that a beach entry requires. Never underestimate the amount of space this opening will take and how its inclusion may impact the available area for a traditional shallow end. Per building code, the beach entry slope must have a 4-to-1 length-to-height ratio. That means a pool needs a 12-foot-long slope to accommodate a 3-foot depth. So the pool opening alone consumes a considerable amount of square footage that otherwise might have gone to making a larger shallow end. Now, if backyard size or pool length is limited, a solution may be at hand: It’s a variation known as a modified beach entry. This newer kind of configuration is catching on because it saves space. The slope can be only 8 feet long, versus 12. But instead of extending all of the ways to reach the pool bottom, the slope cuts off and forms a step to deeper water. Here, the same flagstone in the pool deck is used for the surface of the beach entryway, creating a smooth, uniform appearance. Another consideration is the functionality you desire from your pool. For example, if sunbathing is a key reason for wanting a beach entry, a better—and more affordable—alternative exists: A tanning ledge (also called a Baja shelf) requires much less space and provides a better option for a smaller pool. If you plan on having a pool for diving, the impact of a beach entry on pool dimensions will be particularly significant. A diving pool needs a deep end of at least 8 feet. To meet building code, the pool’s slope must transition from the shallow end to the deep end adhering to a specified grade. Typically, that requires a minimum pool length of 32 feet. Now, throw a beach entry into the already intricate mix of dimensions, and the slope will require even more length—requiring an even longer pool to accommodate it! Representing a modern take, the beach entry here is covered in tile for a contemporary look and feel. Yes, your selection for pool decking is another factor. When constructing a beach entry, certain materials do not work well for the deck that must merge directly into the entry. The best choices are flagstone and almost any kind of poured and decorative concrete. Paver stone decks pose some challenges to achieving a smooth entry-to-deck transition, but they work. Planks of natural and composite wood are poor choices for this purpose. Of course, project finances should be taken into account when considering a beach entry. No doubt about it, this upgrade will increase construction costs. Depending on the area of the country where you live and variables such as the size, style, and material used in your pool and deck, this custom feature may run an additional $3,000 to $7,000. Larger, wider, or more complex versions will run more. The very long, progressive entry of this commercial pool is distinguished by a row of bubbler fountains. Think about the pool style or “look” you are seeking. A beach entry perfectly suits a tropical or lagoon-type aesthetic. It can also work for a rustic, pond-like pool design. But if you want your pool’s overall silhouette to be sleek and modern, a beach entry’s natural appearance may not be the ideal fit. (An exception here may be the less-common tiled beach entry.) In these cases, a better style alternative may be a very large tanning ledge with angles that complement the pool’s contemporary shape. A beach entry provides an array of style and functionality benefits to a backyard pool. However, you and your pool contractor need to weigh any advantages against factors ranging from your pool’s aesthetic style to available backyard space. The smart advice is to thoroughly review a beach entry option with your pool builder. Bring it up in the context of all the other design and function goals you have for your pool, family members, and your budget.